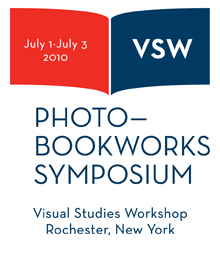 The following is a brief conversation with Tate Shaw, director of the Visual Studies Workshop, in regards to the upcoming Photo- Bookworks Symposium. A few years ago we started recognizing that a lot of photographers were using print-on-demand services to make books, rather than portfolios, to present their work. But many of these photographers aren't thinking enough about sequencing, pacing, or the possibilities for different materials to support their ideas. The goal of the symposium is to expand the potential for the photo book-as-art within a new production generation--in an era with access to print-on-demand and desktop publishing--in order to educate on the distinctive time/space art of the photo-bookwork. There isn't a theme per se. Photographers who work in the book form often blur subject lines and you'll see many themes in one book alone. So we have gathered practitioners that are making complicated, interesting projects where the editing, sequencing, pacing, and sometimes the materials inform the photographs for books that are themselves works of art. There is an impressive list of presenters, how did you decide who you wanted to have participate? I focused a lot of attention on practitioners who are also invested with publishing projects. I felt artist/publishers would have more diverse experience to present from. I also contacted curators inviting them to suggest those books they would like to discuss. This is how the conversation between Anne Wilkes Tucker and Alec Soth materialized. In the very early stages I organized a photo-book club with some thoughtful friends and colleagues--a book club where you didn't have to read anything prior to coming, you just had to come with a few photo-books to share. This was a great way to see a lot of books I may not have found on my own necessarily. How do you see the artists' book fitting into the photography world now and in the future? The point of this for me is to further educate practitioners on the potential of the book as a complex form of display. It seems to me that if the facility is growing (with print-on-demand and the like) and the practitioners are informed of the potential for complexity in the book form, then more photographers will self-publish works and we will have direct access to artists' ideas. The problem is always distribution--how to distribute books that you make on your own? Some interesting developments are taking place, however, such as Joachim Schmid's small but growing ABC: Artists' Books Cooperative with links to self-publishers where you can get books directly from the artists themselves. More book fairs and festivals for photo-books are popping up each year as well. What is the Visual Studies Workshop's mission? Visual Studies Workshop is committed to expanding the potential of the media arts, and their impact on contemporary culture, through innovative programs in education, exhibition, publication, research, practice, and community service. We were founded in 1969 by Nathan Lyons and our programs support photography, artists' books, film, video, and new media projects each year. We also have an MFA program in Visual Studies accredited through the College at Brockport, State University of New York. Our grad students are connected to the nonprofit media arts center, where activities such as the symposium are taking place, and their education and the center's programs support one another. What makes up the artists' books archive? Joan Lyons founded the VSW Press in 1971 to facilitate artists publishing projects. Because we have actively contributed to the field, publishing over 450 projects in the past 40 years, artists and publishers send us books for our collection and for review in the journal we publish, Afterimage. The Independent Press archive is where these books are held. The archive has grown to be around 5,000 titles by independent photographic, visual, and language artists. Some of the most influential artists' books and small poetry of the past 35-40 years can be found in the archive.